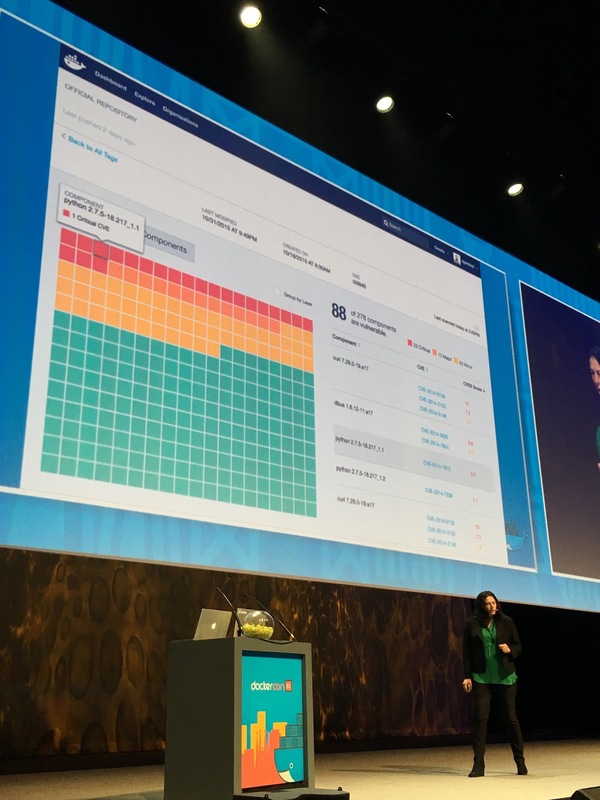 DockerCon EU Day 2 Keynote "Live Blog"
This was a "Live Blog" from the keynote this morning. Took me a bit to get it somewhat cleaned up and get access out to post this. - 20% of all content pulled from Docker Hub is “official images”, but what about all the others? You know you can trust an official image. Project Nautilus was brought out to address this other 80%. - Talking about Automated Builds - 60k automated builds per week, 300% growth since January 2015. Automated Builds 2.0 is a rearchitecture of the system to address time and quality issues. - New Build System uses per-Repo Dedicated Builders (you don’t share a build queue with anybody else anymore), starting a fresh build environment every time. This increasing time of parallel builds as well as guaranteed quality of a clean environment. - Now - to push to production from staging, Tutum shows a visual representation of the containers being upgraded. Production is upgrading in a rolling fashion automatically. “One click upgrade to production"
- What about resiliency in production? What is we take down a datacenter in production? 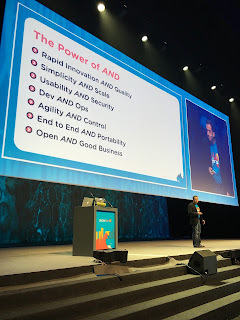 - Customer on stage - Talking about consistency between development and production, simplification of tools for dev and ops, ability to deploy on their cloud, and the scalability and increased high availability provided by moving to Docker containers. This is a sneak preview of the results they have achieved. - quoted Adrian Cockcroft “speed is the market share"
- This starts at the app level - How doe we know which images to trust, who signed an image and when, how to automate, etc. - What about the Run aspect of all of this? What about the control plane? - Self-Service App Deploys & Updates, Provisioning & Config of Heterogeneous Clusters, LDAP/AD Integration with Docker Trusted Registry, Native Docker API’s and CLI, Monitoring, Logging. DockerCon EU Day 1 Keynote "Live Blog"
Going to try something new here on The Cloudcast. 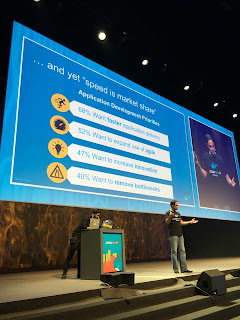 It's been a long time since I did a blog, I'm at Dockercon EU this week and there was some interest on Twitter to get more info out about the keynote. Wireless was down during the show so this is a "semi-Live Blog". Might be some typos in here and this is a brain dump as things happened during the keynote. - Working up to a story and a demo. Story of a developer on the first day of work. How soon could be developing an application? - Simple as download the Docker Toolbox and run one command. - How to give developers usable security? 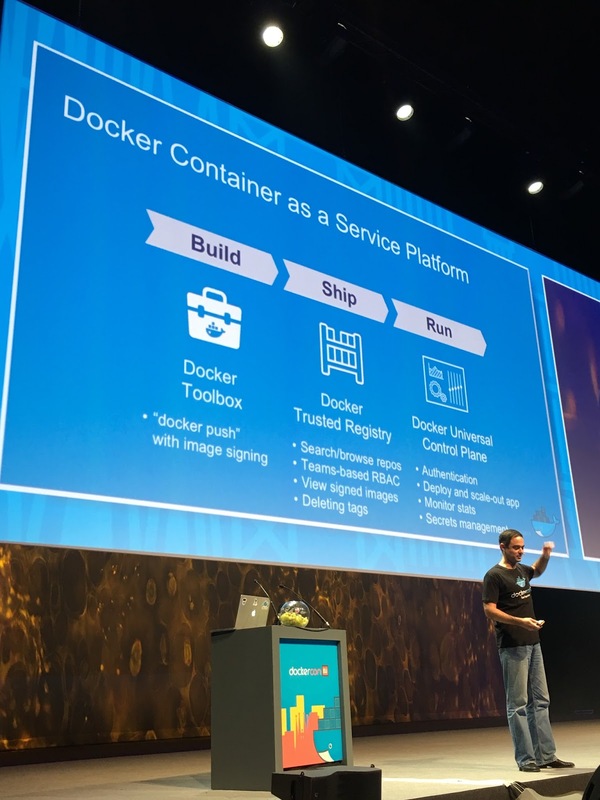 How do we move beyond Docker Content Trust and Notary? (Demo of the product) - plug the hardware key into the laptop, enable Docker Content Trust, docker push to Docker Hub, touch the key (physically) to prove you are a human and this isn’t a “bot” or something malicious, enter a password, done. - Huge question with a lot of different answers - “Am I running vulnerable containers?" - Took the demo (Day 1 app and scaled this up to 1000 nodes in Swarm) - Now using swarm bench to scale this up to 50k containers across 1000 nodes. Once they are up and running, Swarm scheduler balances them across the cluster - real time this was done in less than an hour. The Cloudcast #213 - What is Immutable Infrastructure? Topic 2 - What does streaming analytics mean? 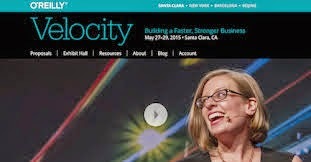 Why do companies care about getting analytics faster? Why build an analytics engine to solve a monitoring problem? Topic 3 - You mention (intro video) that you’re a company that builds services for distributed systems, which are run by product teams, not IT. You were previously at VMware. Can you talk about the different mindset those product teams have vs. IT teams, especially how SignalFx takes their ideas and feedback? Topic 4 - Walk us through how your customers interact with your service? Where do metrics come from (app, message queue, etc)? How do you secure that API interaction? How are metrics different from logs or events? Topic 5 - In the same vein as the shift from IT to the Product Groups, your co-founder mentions that Developers are closer to production than ever. What does that mean to the evolution of tools and overall psyche of application developers? Topic 6 - You mention that SignalFx “double purposes as a Application Intelligence solution”. We’ve been watching lots of interesting SaaS applications emerge that tend to have a more singular purpose (Logging, PerfMon, AppIntelligence, etc.). Are you hearing from customers that some consolidation of functions is needed? Topic 1 - It’s unusual for us to have guests from different companies, but your stories have commonality. But let’s talk about both of your backgrounds (and company backgrounds) first. Topic 2 - When I was watching this video of Khash (Cloud 66) at this Hacker News meetup in London, it looked to me like a concept I call “unstructured PaaS”, which is sort of a DIY PaaS, with the best-of technologies. Topic 3 - We’re curious to learn more about ContainerNet, that is the backbone for the container networking of Cloud66 (using Weave technology) and how it really works. Topic 4 - Both of you are at the forefront of this transition of container-centric application deployments. Where do you see the maturity in the market and what are the next big opportunities? Topic 5 - You both seem to believe in the model of modularity for these new architectures. Beyond “giving customers choice”, what are the big focus areas in building elements of these modular architectures? Topic 6 - What are some of the tangible business advantages that you’ve heard from customers when it comes to choice and modularity in this container-centric application model?